TSA Guidelines suggest travelers arrive at the airport at least 2 hours prior to departure time. A government-issued ID (federal, state or local) is required. 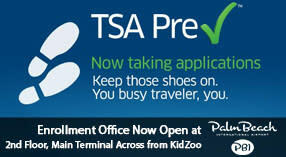 Be prepared to show this ID at various locations, such as the ticket counter, TSA security checkpoint and gate. Refrain from gift wrapping packages in checked and carry-on baggage. All wrapped packages are subject to opening by the TSA. On most airlines, the number of carry-on bags is limited to one personal item such as a purse or briefcase and one bag (size to fit in overhead bin or under seat). Verify details with your airline. Equipment used for screening checked baggage will damage your undeveloped film. Never place film in your checked baggage. Place film in your carry-on baggage or request a hand inspection. Parking is available in the Premium, Short Term and Long Term Parking garages and the Economy Lot. The Economy Lot provides frequent shuttle service to and from the arrival and departure levels. Vehicles are strictly prohibited from stopping or being unattended at curbside departure and arrival areas. Those travelers requiring assistance should contact their airline and advise the airline of their need in advance. FAA Regulations require that your name appear on all checked baggage. Carry medication, keys and valuables with you, not in checked luggage. To report lost and/or damaged luggage, take your claim check to the Airline Baggage Services office located in Baggage Claim, Level One. Children under 2 years old traveling with ticketed passengers are welcome but the airline providing transportation should be notified when the reservations are made. Children 2 years old and older require a ticket for travel, contact your airline for specific information on their policies. If your child is traveling alone, alert the airline and provide the name, address and telephone number of the person meeting your child at the destination. A responsible adult must accompany the child until boarding. The responsible adult should remain at the airport and confirm the child&apos;s flight is in the air before leaving and then monitor the flight&apos;s arrival at the destination. There are age restrictions on children traveling alone, please check with your airline for specific information on their policies.